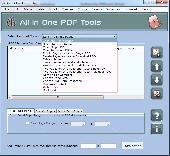 Advanced Batch PDF Page Extractor is an affordable utility targeting users who frequently extract specific pages or page ranges from PDF documents, divide large PDF files into smaller documents or delete unnecessary PDF pages. AWinware pdf page replace tool is advanced and easy to use desktop utility which helps in inserting a pdf pages into another pdf at specified position like after page 9 and 14. Tool has option to replace specific page position with another pdf page.